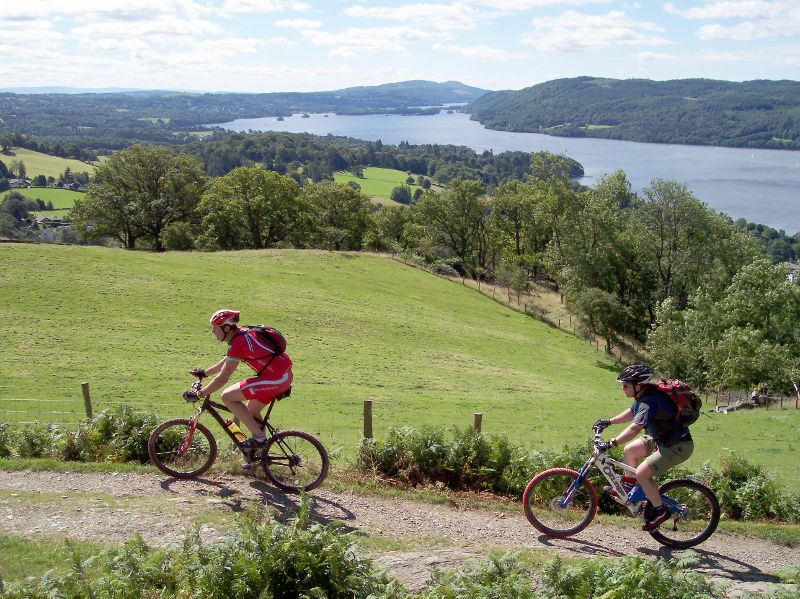 Starting in Waterhead just outside Ambleside, on the shore of lake Windermere this mountain bike route heads east to Kentmereand back. 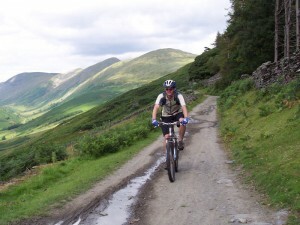 It's not an easy ride with just over 4100ft of climbing in 22 miles. There are plenty of steep climbs, the biggest being the climb out of Kentmere to the top of the Garburn Pass. 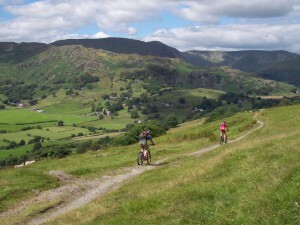 This is definitely a climbers route, but one with plenty of great descents. 1. Start at the car park near the Regent Hotel on the edge of Windermere (GR376033). Exit the car park at the main road and turn left. At the junction with the A591 turn left and follow the sign for the town center. Go past the entrance to one way lane on the left then take the following lane on the right to climb at 45deg away from the main road (GR377037). A short distance later turn right up a steep lane signposted as a bridleway. Follow the tarmac as it winds it’s way uphill then at the junction where the lane turns sharp left uphill follow the dirt track straight ahead, signed as a bridleway. This trail continues on the flat for a while until it comes to a junction (GR380031). Bear left on the bridleway that climbs to Jenkin Crag (incorrectly signed as a footpath). 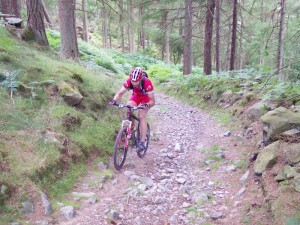 This is a very technical track through the trees that climbs over bedrock and roots. After turning left up a large slab section follow the track 90deg right, over a bridge, to climb more slabs. 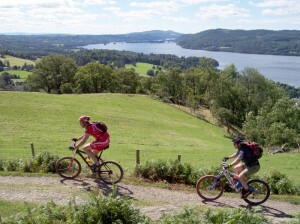 The track eventually emerges from the trees and flattens off, with great views of Windermere on the right. Follow the track to a gate at a farm (GR390029). 2. Go through the farm and follow the lane downhill to the gates just after a cattle grid. Go through the gate on the left and climb the singletrack as it winds its way up past a derelict building, through a stream crossing, and on to a gate and the junction at the top (GR397024). After the gate follow the wide track to the right. Stay on the main track and bear left around the hillside for a quite rocky but non-technical descent that becomes tarmac just before reaching a junction at Troutbeck (GR407026). 3. Turn left and go past the Post Office. At the next junction go straight on to a small car park on the right a short distance later, in a courtyard in front of a house set back from the road (GR408027). The turn into the couryard is signed as a bridleway but the sign is hidden from view on the wall on the right inside corner of the junction. At the house at the back of the car park take the thin rocky track on the left that descends to stream crossing. After crossing the stream follow the track to a church then a junction with the road at the bottom (GR413028). 4. Turn left onto the road then a short distance later take the road on the right leading into the Limefitt Park campsite. Follow the road 90deg right then go through the center of the campsite to the buildings and house on the far side. At the house follow the track marked as a bridleway left around the back of the other buildings. Climb the short track to the next junction. Turn right and climb this trail to the a gate (GR417027). After the gate turn left and climb the steep, rocky, technical climb between the drystone walls. Climb through a left hander, over the slabs, after which the trail becomes easier before coming to a junction with a track on the right, just before a gate ahead (GR420031). 5. Turn right and follow the track as it bears left. The track soon starts to descend, over a few rocky sections, while going through a gate and past a small reservoir on the right. It eventually becomes a wide dirt track that finishes at a junction with a lane (GR423006). Turn left and climb the lane over a low crest before descending, while going past three lanes on the right. At the bottom of the descent, a short distnace after the thrid lane on the right, turn left on the lane marked as a bridleway (GR435996). Follow the lane uphill to High House. At the house go though the gate ahead and turn immediately right, picking up the thin rocky track that leads off to the left, from the left hand side of the main house (GR437005). 6. 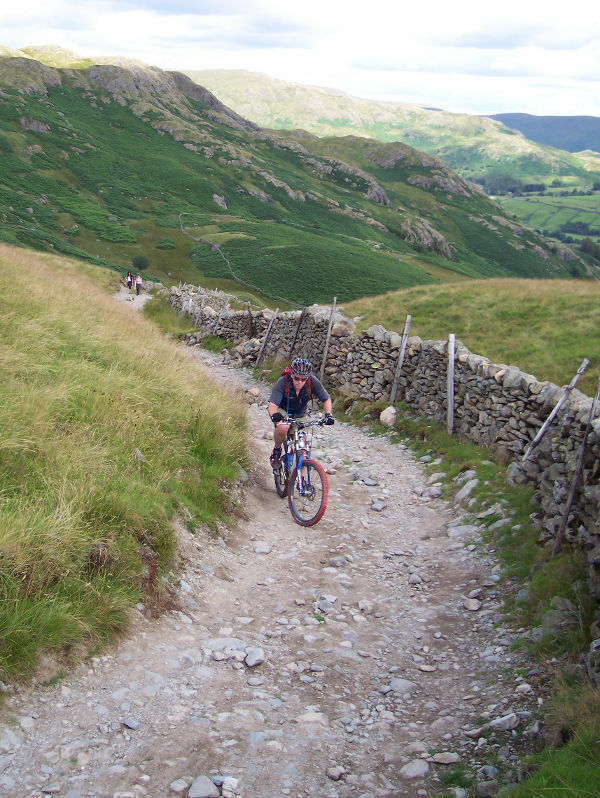 Climb a short way to the next gate then follow the track through a field, along the drystone wall on the right. After the next gate follow the trail to the right to another gate at a three way bridleway junction (GR440009). Turn left along the track with the drystone wall on the left. The track winds its way along the flank of the hill gaining a small amount of height until it reaches a fords across a stream just before a gate (GR443027). 7. Cross the stream and turn right, before the gate, to follow the hard pack track on the left of the stream. After going through a couple of bends and a ford the track reaches a gate. 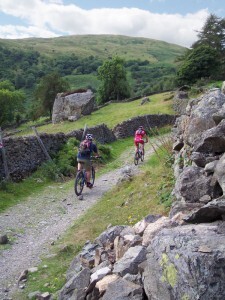 Go straight on through the gate for the Sawmill Cottage descent that starts grassy but becomes rockier as it drops. Follow the obvious trail and go through a few gates before finally coming out to a lane and some buildings. Follow the lane straight ahead for a while, then go through a left hand bend and go over the bridge to a junction with the road just after (GR455012). Turn left and follow the tarmac a short distance to the bridleway signed off through a gate on the right (GR456015). Turn right through the gate and climb into the trees. After the next gate follow the main rocky trail up through a couple of steep and tricky, but do-able, bends. Once out of the trees the trail turns right, starts flattening out and becomes grassy. 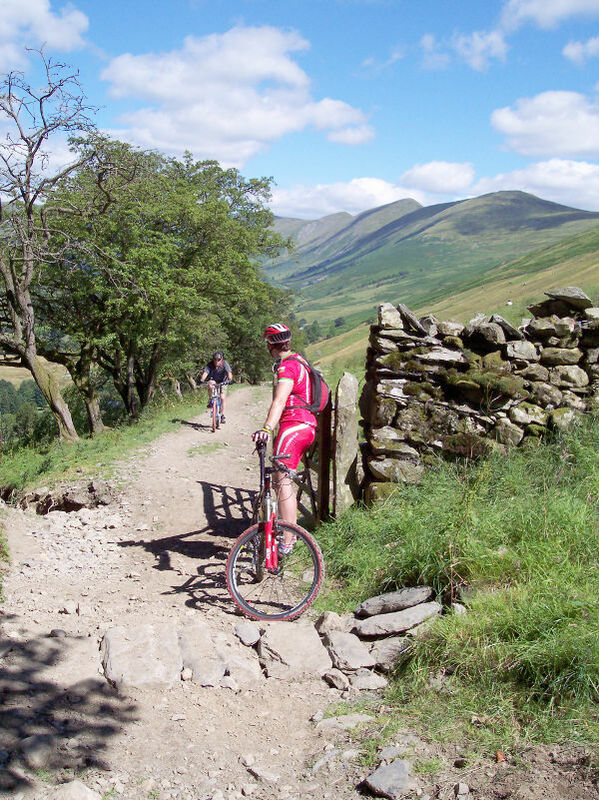 Follow the track ahead and go over the crest for a short descent to a left turn that brings the track parallel to a drystone wall on the right. Go straight over the crossroad in the trail and on to the next gate (GR468018). 8. Go through the gate and turn left onto the wide track. After the next gate climb away to the right on the singletrack signed as a bridleway. At the fork in the trail continue on the rocky trail to the left. Climb over the crest, go through the next gate, and continue ahead on the track that becomes more grassy and a bit boggy in sections to a junction just after a derelict building on the left (GR473034). Turn left and climb the thin rocky track up the left hand flank of Green Quarter Fell. 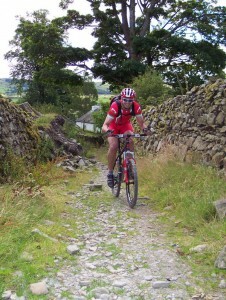 Once over the top go straight on down a loose, rocky track to a gate in the drystone wall ahead. Go through the gate and follow the rutted grassy track. 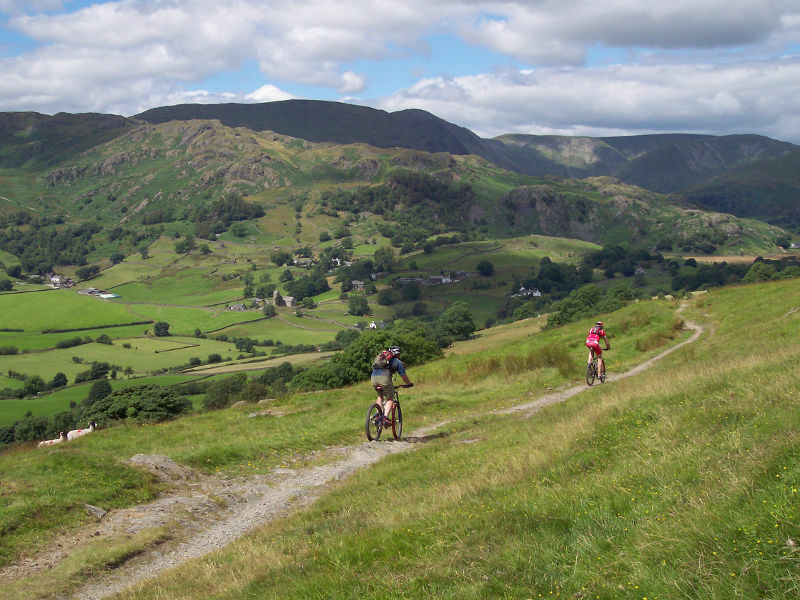 The track soon bears right and descends across the side of the fell towards Kentmere, going through a couple of gates on the way. The track is fast and soon becomes quite rocky. Continue straight ahead all the way to a gate and a lane at the edge of Kentmere (GR461040). 9. Turn right on the lane and climb to the next junction, then bear left and descend to the following junction (GR461042). Turn left and descend the lane to the junction at the bottom. Turn right and go over the bridge then climb to a junction at the church. Follow the lane to the right around the side of the church. The lane then bears left and comes to a gate at a building (GR455044). Directly before the gate turn right up the steep rocky track signed for the Garburn Pass. The track soon bears left and leads to some more gates. 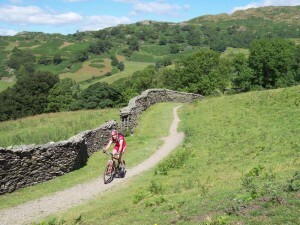 Go through the gate on the right and ride between the drystone walls past Badger Rock. 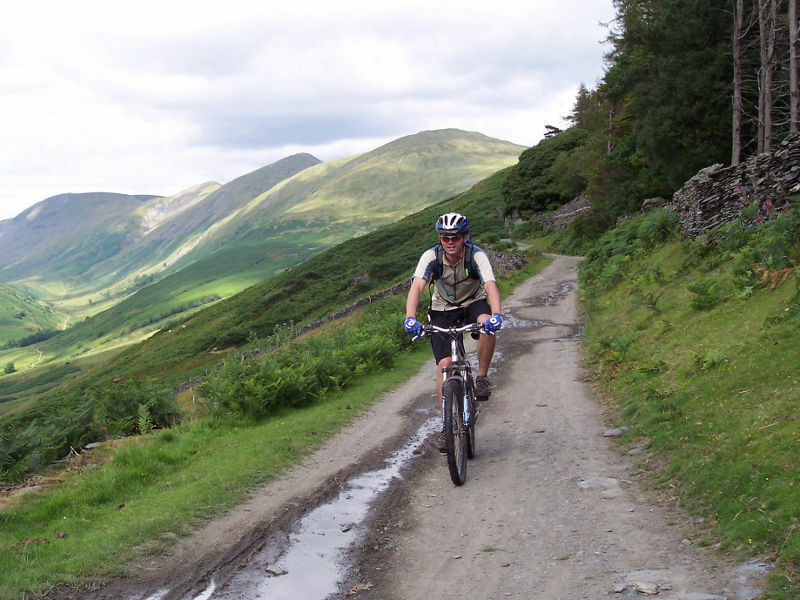 Follow the main track up to the top of the Garburn Pass. 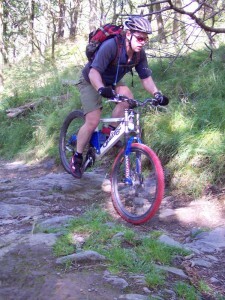 The first section is steep, rocky and loose followed by a flatter section. At the bend 2/3rds of the way up the trail kicks up again, becoming steep, rocky and loose. It then flattens out again just before reaching the top (GR436043). I stopped six times on the way up and walked once for 30m. It is a very hard climb but I saw someone on a Santa Cruz Superlight ride it all, only dabbing once, so it’s doable. 10. 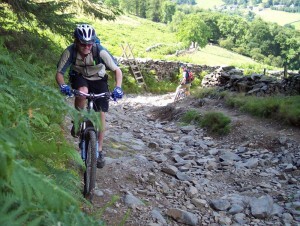 Go straight on over the top of the pass and descend to a left hand bend. Turn left and go up a gentle climb to a gate. Go through the gate and descend the wide, fast and rocky track through a few gates, positioned far enough apart not to interrupt the flow of the descent. After one of the gates lower down bear right at the junction (GR420031) and descend the previously climbed trail. At the next junction, on a left hand bend with the gate on the right, continue around the bend to the left to a forked junction. Take the track on the right and descend the loose rocks through a right hand bend, to a gated junction with a road at the bottom (GR412025). 11. Turn right and ride a short way to the junction with a lane on the left (GR412027). 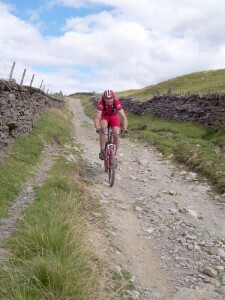 Turn left and climb to the junction at the top, in Troutbeck. Turn left, then at the junction at the end of the buildings turn right and climb the lane to start retracing the outward leg of the route back to Ambleside. The tarmac soon becomes rocky track. Climb, bearing right, to a junction on the left where the track flattens off (GR398023). 12. Follow the signed bridleway through the gate on the left and descend past the derelict building to the two gates at the bottom leading to a lane (GR392502). Turn right and climb the lane to the farm. At the far side of the buildings go through the gate on the right, then immediately turn left through the next gate. 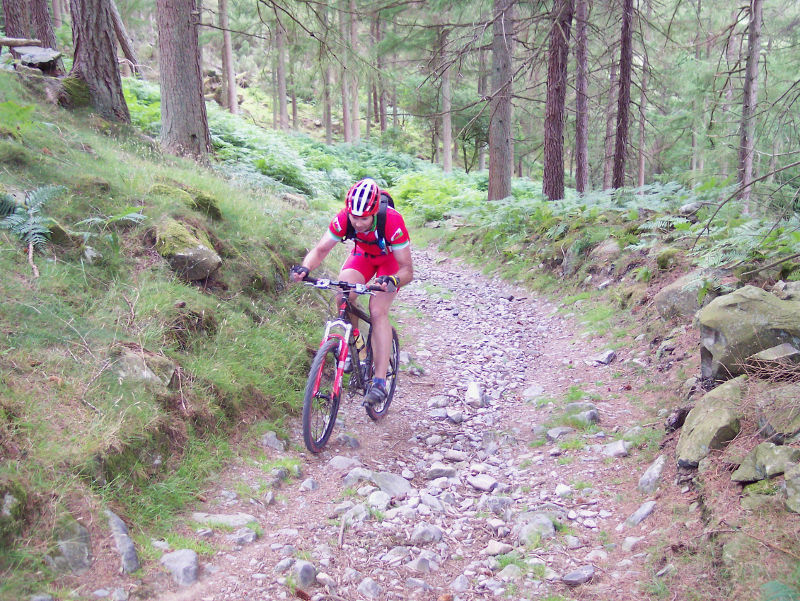 Follow the trail into the trees and descend through a number of bends and over the previously climbed rock slabs. At the junction with a trail on the left, the one with the incorrect footpath sign, take the track off to the right. At the next junction go straight on and descend the tarmac, being careful on the blind corners, to the junction at the bottom (GR377037). Turn left to the main road then turn left again. A short way along the main road turn right down the one way street (GR377034), between the walls, and follow it to the junction with the main road at the other end. 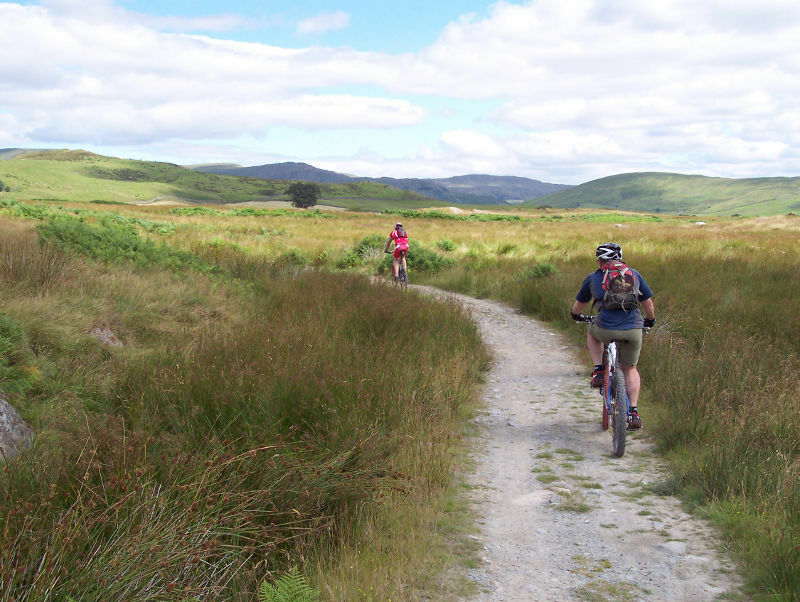 Turn left then left again into the Waterhead car park to complete the ride.